Get up close and personal with the Caribbean’s most playful and friendly dolphins. You’ll be welcomed into the water by the bottlenose beauties for a swim and get a chance to enjoy a wet hug, a warm handshake and even a special kiss. If swimming isn’t your thing, this dolphin interaction can also be enjoyed from a platform in the water. While you are in the water, the marine mammal specialists will teach you some fun facts about the dolphins and how they care for them. Next you’ll make your way, to the Grand Cayman turtle farm, one of the world’s few Turtle Conservation Parks. Here you’ll have the chance to take a look at the breeding pond, which is home to the green sea turtles and also the turtle touch tanks, where you can reach in and touch the yearling turtles for the perfect photo opportunity. Smile for ‘Smiley” the 9 foot saltwater crocodile as he puts on a show! Keep the memory of this special day alive when you get local crafts from the Splash Gift Shop. 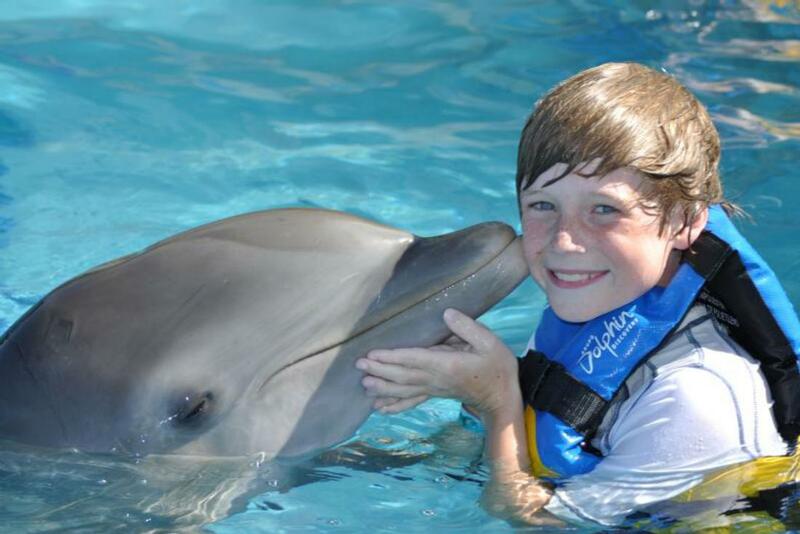 Swim, kiss, hug and interact with dolphins for an up-close experience with dolphins. 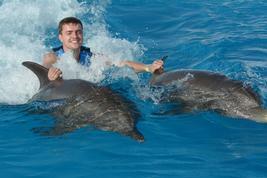 The trainer will educate you on the dolphins during all the fun. Interact with turtles on the Grand Cayman turtle farm. Visit Smiley’s Saltwater Lagoon for a saltwater crocodile show. How to get to Dolphin Discovery Grand Cayman: Take a taxi to Dolphin Discovery, located on Northwest Road West Bay, across the street from Turtle Farm and approximately 15 minutes from George Town. West Bay taxis from downtown cost approximately $20 Caymanian Dollars. Dolphin Discovery address: Northwest Road West Bay P.O. Box 30247 Grand Cayman KY1-1209, Grand Cayman B.W.I. How to get to Turtle Farm Grand Cayman from Dolphin Discovery Grand Cayman: The Turtle Farm is located in front of Dolphin Discovery just across the street, about 30 meters. Turtle Farm Grand Cayman address: 825 Northwest Point Road, West Bay, PO Box 812 Grand Cayman, KY1-1303, Cayman Islands. The activity time at the Turtle Farm is approximately 45 minutes to an hour, however guests may spend more time. The park closes at 4:00pm.